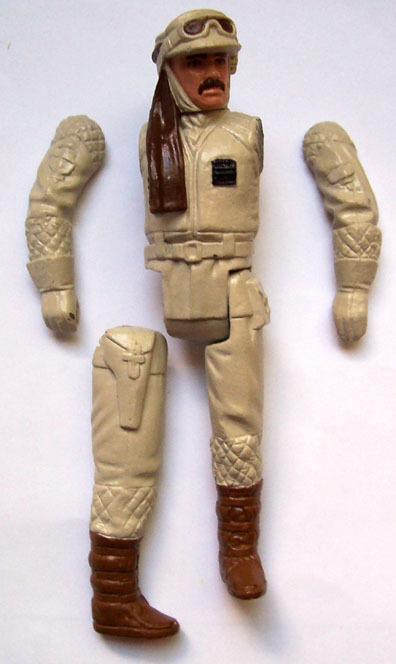 The Rebel Commander action figure debuted as part of Kenner's Empire Strikes Back line. This prototype version is referred to as a hardcopy. Urethane figures of this nature were meticulously painted for use as photography samples, industry show display samples, and as paint masters. As the photo conveys, the figure can be partially disassembled on a whim revealing the underlying materials. All four limbs are cast in carbalon, a urethane commonly seen on hardcopies from the SW and ESB eras. The head and left leg appear glued in place making it difficult to identify the material used on the head. The torso is cast in green urethane, commonly referred to as dynacast. 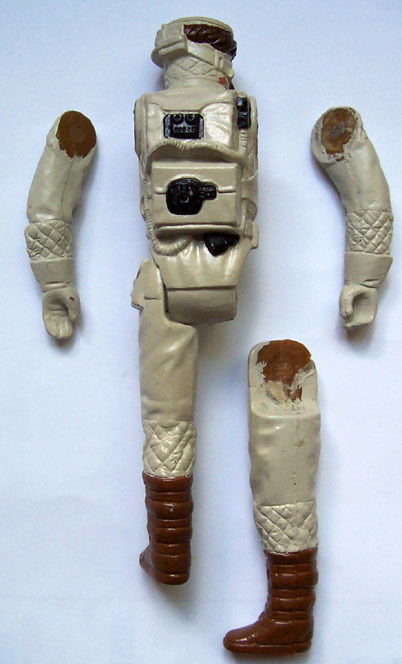 This particular hardcopy was once part of a staggering find of painted 3 3/4" action figure and Micro Collection 4-ups unearthed and brokered by The Earth Collectible Toy Mall for an ex-Kenner designer. The find was widely publicized in Tomart's Action Figure Digest (AFD) and created quite a stir amongst prototype collectors at the time. It's not everyday that such an impressive batch of prototypes, yet alone hardcopies, presents itself. After enjoying time in a number of other collections, this hardcopy has made its way to Broc Walker's collection where it will undoubtedly provide strategic commands to Broc's Rebel Soldier action figure collection.